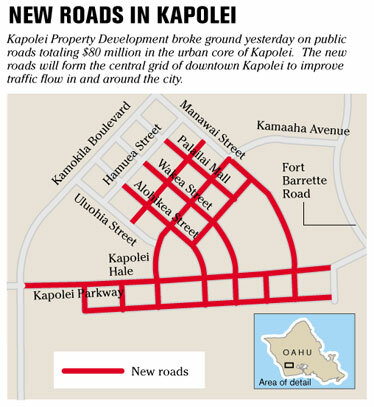 Kapolei Property Development broke ground yesterday on eight road projects that will form the central grid of downtown Kapolei to improve traffic flow in and around the city. The projects include two new roadways and the extensions of six others. The eight projects make up $80 million of a $172 million initiative between Kapolei Property Development and the city announced last August. It is the largest privately funded effort to build public infrastructure in the state. The two new roadways are Village Walk and one not yet named. The roadways that will be extended are Kamaaha Avenue, Manawai Street, Alohikea Street, Wakea Street, Waianiani Way and Kapolei Parkway. The roads will provide access to 5.3 acres of land Kapolei Property Development is giving the city for an integrated bus and transit facility and the planned transit route on Kapolei Parkway. The work will also include extending Palailai pedestrian mall and installing six traffic signals. The projects are scheduled to be completed by the end of 2010. The company recently completed sections of Haumea and Manawai streets and Kamaaha Avenue. It is currently working on its portion of the Kamokila Boulevard extension. The city expects to complete its portion by the end of next year. Kapolei Property Development is an affiliate of the James Campbell Co., formerly the James Campbell Estate.